We all want to live in a prosperous state with thriving communities. Washingtonians consistently identify the same set of public priorities for state leaders: excellent schools, well-maintained infrastructure, protecting the vulnerable, quality health care, responsive police, and stewardship of the state’s natural resources. Decades ago, Washington State consistently invested enough to establish a foundation of opportunity and prosperity. Yet since the 1990s, the share of our economy devoted to public investment in our people and communities has been declining – even as incomes soar. The budget increases of the past few years are still making up for losses from the Great Recession. We are nowhere near the levels of public investment the people of our state need to thrive. 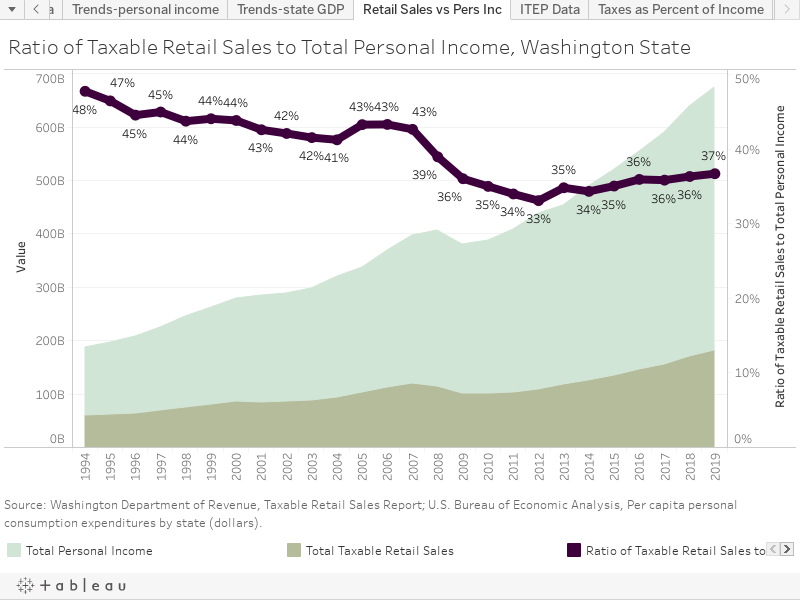 Washington’s revenue structure relies heavily on regressive sales taxes, whose revenues grow much more slowly than our state’s population and economy. Without new revenue sources, our state will face continuing budget shortfalls, putting education, infrastructure, health care and other priorities at constant risk. Washington’s budgets (there are actually three) provide the foundation for the state’s economy, serving more than 7.4 million residents and approximately 200,000 businesses. The Operating Budget pays for most day-to-day operations of state government. The Transportation Budget pays for roads, public transit and related investments. The Capital Budget supports construction, acquisition and maintenance of public schools, higher education facilities, state buildings, public lands, parks, and other assets. Nearly 60 percent of tax revenue collected in Washington is devoted to education, providing public education for nearly 1.1 million K-12 children and making higher education available to more than 240,000 students. Health and human services – which includes AppleHealth (Medicaid), early learning, child protective services, mental health, and other services – comprise another 31 percent. In order to build and maintain a high quality of life for all Washington residents, the state’s budget needs to keep up with growth in the state’s economy and population. Throughout the 1980s and 1990s, Washington reinvested more than 6 percent of total state personal income in public priorities. That declined in the 2000s and hit a trough of 4.5 percent after the Great Recession. State leaders have yet to restore public investments to pre-recession levels. The high cost of higher education has become an obstacle to opportunity that creates a drag on our economy, deprives businesses of qualified workers and customers and stifles entrepreneurship. Baby Boomers were able to work a summer minimum-wage job to pay for their tuition. But in the 1980s, legislators began to steadily cut state investment in higher education. Today, the cost of a bachelor’s degree from one of Washington’s public colleges or universities often requires loan amounts that cause the state’s young people to postpone marriage, homeownership, children, and the American Dream. State revenue for the Operating Budget comes from a variety of taxes and fees. The largest source – by far – is the retail sales tax, which comprises 47 percent of current revenue. After that, the largest revenue sources are business and occupation taxes at 19 percent and property taxes at 14 percent. State sales tax revenues doesn’t keep up with our state’s growth, even though sales tax rates have increased over the years. Through the middle part of the 20th century, when our economy was based largely on the consumption of goods, sales tax revenues largely grew with personal income. But for decades, our economy has been shifting from the consumption of goods to services – and most services are not subject to taxes. Our economy has changed, but we haven’t updated our tax system. Our tax system is also extremely unjust. Taxes like sales and property taxes are regressive, meaning poorer people pay proportionally more than richer people do. 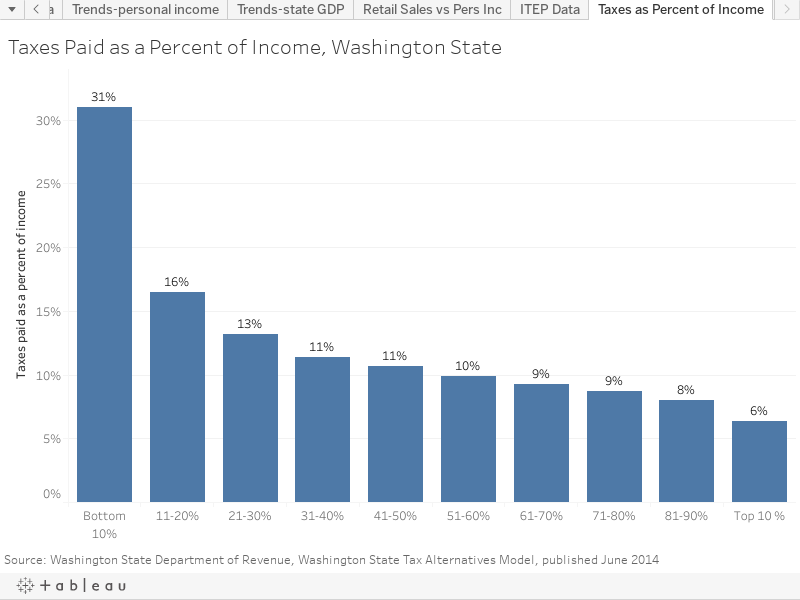 Washington has the dubious distinction of having the most regressive tax structure in the nation. There are many possible solutions to bolster our state’s tax structure, but they revolve around two basic principles – moving to more stable revenue sources and sharing tax obligations more evenly between wealthy residents and the rest of us. Closing tax loopholes and exemptions would create new funding for education, health care and other priorities. Washington has nearly 700 tax breaks, credits, and exemptions to its property, sales, and business and occupation taxes on the books. Many benefit corporations at the expense of individuals, families, and small businesses. For example, RCW 82.04.4281(a) allows nonfinancial firms to invest money and reap dividends untaxed. It encourages large businesses to put their money into the stock market and share profits with stockholders, instead of reinvesting in jobs and communities. The Department of Revenue estimates that the budget would gain about $200 million per year if the exemption were repealed. Another possibility is a capital gains tax, which 42 other states already have. Capital gains are profits from the sale of corporate stocks, bonds, and other high-end financial assets. This would help make Washington’s tax structure somewhat less regressive, by requiring the wealthiest residents to pay a little more. Versions of a capital gains tax introduced in the Legislature in previous years exempted retirement plans, sales of residential properties, college savings accounts, and the modest investment accounts of all but the richest 1 percent of Washingtonians. By eliminating this tax break and collecting from the very wealthy who are making millions through capital gains, our state will have more to invest in our early learning, higher education and health care. Allocating a portion of funds raised by a capital gains tax to fund the state Working Families Tax Rebate would also reduce taxes on low-wage workers. This rebate is our state’s version of the federal Earned Income Tax Credit, one of the most effective programs to lift low-wage working families out of poverty. It was enacted by the Legislature in 2008 – but funding has never been allocated to get the program up and running. While the Legislature and the governor ultimately decide how much money to raise and spend, Washington voters can – and should – play a significant role. One of the best ways to become involved is to find an organization working on something you’re passionate about. There are interest groups covering everything from agriculture to transit – and many of them keep tabs on budget and legislative developments that affect their members. Get active in one of them – or your union or faith community – and you’ll learn more about what’s happening and where your voice is needed. Make sure you’re in touch with your state representative or senator. Find out who they are at app.leg.wa.gov/districtfinder, and ask to receive updates about state budget issues. Let them know your priorities for funding and what kinds changes you’d like to see in Washington’s budget and tax structure. 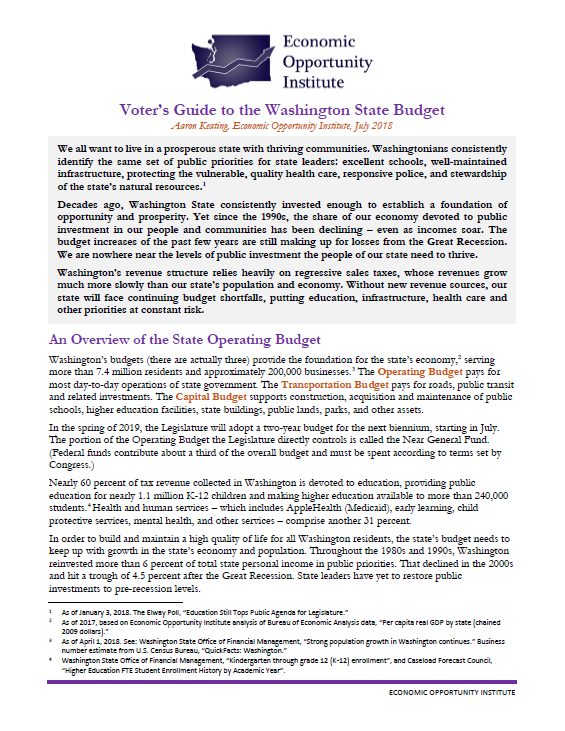 The legislature also publishes several useful resources for learning more about what’s in Washington’s budget. To view or download these and other documents, visit fiscal.wa.gov/ and click “Publications and Reports” under Other Resources. Washington’s budget is one of the state’s most powerful policy levers we can use to address the challenges facing our families, schools and communities – so make your voice heard throughout the process! Washington State Office of Financial Management, “Kindergarten through grade 12 (K-12) enrollment”, and Caseload Forecast Council, “Higher Education FTE Student Enrollment History by Academic Year”. Institute for Taxation and Economic Policy (ITEP), Who Pays – 5th Edition.